If you've been on the fence about picking up Blizzard's shiny new RTS, you can now try it for yourself. I like demos. In fact, I think demos are great. Every game should have one, so consumers and players can get a feel for a game that you just can't get from a trailer. Blizzard has announced that its excellent StarCraft II - a game that ended up on not one but two lists of our editors' favorite games - now has a demo free for the taking. Yeah, it would have been nice if the game had had a demo when it saw release almost half a year ago, but better late than never. Besides, Blizzard is known for many things, but doing things in a timely fashion is not one of them. 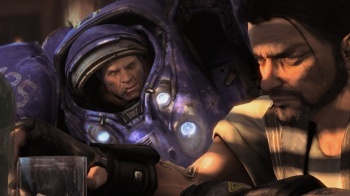 If you're already familiar with StarCraft II, you may be wondering what the difference is between the demo and the Guest Passes that people who bought SC2 probably never used. The Guest Passes require the user in question to already have a Battle.net account, and require said user to be gifted a trial key (duh). In comparison, the demo just requires you to fill in some information and download the thing, no B.net account required. Unfortunately, compared to the Guest Pass the demo feels kind of gimped. With a Guest Pass, players can try out most of the full game, whether campaign or playing the addictive online multiplayer, for 7 straight hours of play (or 14 days, whichever comes first). With the demo, you'll get the first few missions of the campaign - fair enough - but you'll be limited to playing solo skirmish against the computer in Terran vs. Terran 1v1s. For all that I enjoyed the SC2 campaign, let's not mince words here: SC2's main draw is the multiplayer. Not being able to play as the race of your choice against another human being, trying frantically to build up a fighting force before their Zerglings come rushing up your ramp, really limits the appeal. Sure, it's cool to have a demo of the solid single-player content, but if the SC2 multiplayer is your thing then you'll probably want to find a friend who has a Guest Pass and pester them into giving it to you. Ah well, demos are still good things, and every game should have one. I just don't think that this demo is going to promote the game as well as Blizzard would have hoped. If you've been on the fence and don't know anyone with a Guest Pass, grab the demo here.